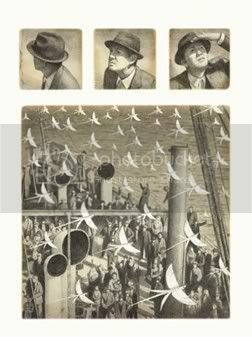 Shaun Tan’s acclaimed and entirely wordless graphic novel The Arrival tells the story of an immigrant who tries to adjust to life in a new and unfamiliar land. Of course, to leave it at that is like saying that Jane Eyre is the story of a governess. It may be true, but it doesn’t tell you much at all about the richness of the story. You all probably know that I’m a big fan of comics and graphic novels, but I’d never read a wordless one before The Arrival, and to be completely honest, I was a little nervous. I was nervous because no matter what the medium I’m dealing with is, I’m attached to words – words are almost always the thing that stands out to me the most. I pay attention to song lyrics, I carefully follow the storyline in videogames; the dialogue in movies and TV series, etc. Well, I needn’t have worried. What The Arrival made me realise is that it’s not so much words that I’m so attached to, but narrative. And a narrative can be conveyed through many different formats. Shaun Tan’s art tells a story, and it tells it well. But more impressively, his art conveys an emotional range as wide as that of the best writing. One of the things I loved the most about The Arrival was how well Shaun Tan used fantasy. I’m not a fan of thinking of fantasies as metaphors—or worse, as allegories. But I think the point of fantasy often is to express things that would be difficult to articulate without it: in this case, the fantastic elements perfectly convey the feeling of strangeness and misplacement that many immigrants experience when coming to a new land. To this man, everything is peculiar. 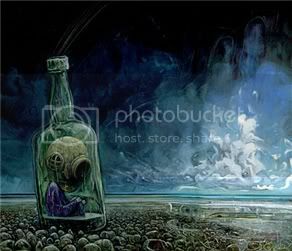 And because what we’re seeing in Tan’s illustrations is a fantasy land where things actually are peculiar, we understand the feeling much better than we would if he simply drew someone arriving in a new land within the limits of our reality. 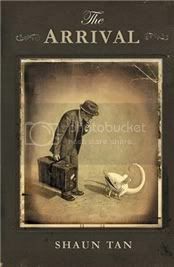 By making readers face the unfamiliar, Shaun Tan gets them to understand the immigrant experience at an emotional level that would be otherwise difficult to invoke. The unnamed protagonist of The Arrival has to leave his wife and young daughter behind at first: he goes to this new land alone, hoping to earn enough to have them join in as quickly as possible. But initially, his loneliness is palpable. And because he’s in such a vulnerable position, small gestures of kindness from strangers gain a whole new meaning. The Arrival is full of these little moving scenes; of little moments that remind us what a huge difference the small things people can do to make one another’s lives easier can make. If this sounds sentimental, then it’s entirely my failing, not Shaun Tan’s. In the book it absolutely isn’t. As you can tell by now, The Arrival really impressed me. Without any words at all, Shaun Tan tells a very human story full of kindness, pain, loneliness, and depth. I feel bad reviewing The Red Tree together with The Arrival when all they have in common is the fact that they’re by the same author. Well, that and the fact that they’re both awesome—but in very different ways. You can probably tell how different they are just by glancing at the illustrations I’ve included here. Tan’s art once again brilliantly conveys the book’s emotional tone, and what we have here is very different from The Arrival’s sepia images. The Red Tree is not a wordless graphic novels, but a picture book. The illustrations are accompanied by short sentences, but needless to say, it’s the art that’s in the foreground. The protagonist of The Red Tree is a girl who is having a bad day, but again—Jane Eyre, governess. That tells you nothing. In only 27 pages, Tan perfectly captures what depression, loneliness and alienation feel like. As I said, in this case there are words, but it’s not really about them. The emotions the girl is experiencing are all conveyed through the art. It’s a bit of a dark, heavy book, but its kindness and lightness are in the fact that it provokes the ever-magical realisation that someone else feels the same. …and then, of course, there’s the ending. I’m not going to give it away, worry not, but I’ll say that it gave me pause. Then again, I was predisposed to have it give me pause, because I’d seen my friends Amanda, Jason and Chris debate about it. The ending seems to at odds with the emotional tone of the rest of the book, but I think that more than to offer an easy solution and dismiss everything the character had been feeling up to that point, it’s meant to remind us of the little things that we sometimes fail to take notice of, and of the difference they can make in our lives. Of course, if you’re too sad you won’t be able to notice any small (or large) positives—that’s the thing about depression, isn’t it? Still, The Red Tree satisfied me. More than in the hopeful note at the end, its comfort and beauty are in the universality of the feelings it expresses. Thanks for this review, I'd not come across this before. While I'm not that familiar with graphic novels, this looks really interesting. I'll look out for it! I have not read any graphic novels before, but you made this one sound very good. And the pictures are beautiful. Thanks for sharing! The pictures from both books look absolutely awesome. It must be really good to be able to completely understand The Arrival without any words in it. The Red Tree might be suitable for one of my daughters, who seems to have more bad days than good. I just noticed you were reading Ballet Shoes by Noel Streatfield, that is one of my favourite childhood books. I do hope you are enjoying it. The thing I got out of the use of fantasy in The Arrival was that it made the situation universal. It was not about, say, immigrants coming to American at X point in history - it was about any immigrant going to any country that will better their lives at any point in history. The themes become universal and people can relate it to their own history as well as empathizing with the history of others. I still think The Arrival is my favorite of Tan's books that I've read. Beautiful review! I haven't had a chance to read The Red Tree just yet, but as you know I was a huge fan of The Arrival. I'm glad you enjoyed it as much. Now we just have to wait and see what else Tan can pull out of his magic hat. It is interesting that he chooses to tell the story of an immigrant in a wordless manner since immigrants often don't have a language to communicate with in the new country. They are forced to use a more visual language. It is also interesting because in language teaching we talk about the expanded textual concept where pictures become important. This has really intrigued me. I love Zee's comment! That is SO TRUE about immigrants. And so true, also, that when you're lonely, the smallest bit of kindness can be so amazing. 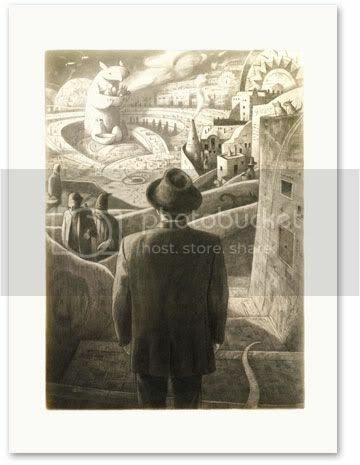 I really want to read Shaun Tan- he seems to be loved universally and his drawings remind me a bit of Chris Van Allsburg. Every time I see that picture of the divers mask in the bottle I resolve to get 'The Red Tree' soon. 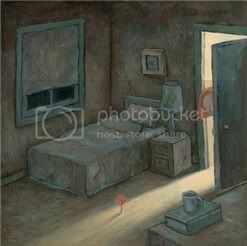 It's a pretty perfect representation of loneliness and feeling odd. It's nice to see the two books side by side so I can note the diversity of Tan's art, just like novelists who change their wirting style it's cool to see an artist who can change their style successfully book to book. Everyone I know who's read it, despite their initial skepticism (and mine), has ended up loving it. I really should get it out and reread it...it's been a couple years for me. I definitely want my own copy when I'm in a position to begin building my library. I've heard so many good things about Shaun Tan. I haven't read anything from him yet, and Mee (from Bookie Mee) convinced me before this to try and pick up at least ONE of his books. I've got The Red Tree on hold at the library, and I think I'll put myself in the queue for The Arrival as well. 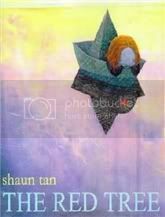 I *still* haven't read any of Shaun Tan's books? Silly, silly, silly me. Sooooo tempted to go dig Tales from Outer Surburbia (did I get that name right?) off Annie's shelf right this minute. I know I shouldn't...but I really, really want to. I'm very intrigued about both these works. The image samples you put up are so peculiar and riveting to examine! If there weren't any words for The Red Tree, do you think you would have been able to figure out what it could be about? I love the part in The Arrival where he opens his suitcase to unpack and due to his loneliness we see his wife and daughter at the kitchen table without him inside the suitcase instead of clothing. So beautifully captured the ache of being parted from one's loved ones. I loved the Arrival and took a week to absorb each page and to create the story in my head. What beautiful artwork in both. I look forward to the day I can buy books again. I'm embarassed that you linked that early review of mine because the more I reflect back on the Arrival, the more I liked it. My mom teaches English as a Second Language to 6-8th graders and I think the foreign/fantasy aspects would really be something they could relate to. Would love to see The Red Tree too. So sad we can't get it in the USA. You know I loved the Arrival to bits. The wordless-ness of it also conveys very well the feeling of being lost and foreign in a new place where its language is not your own. It's like watching movie in a foreign language that you don't understand. That's what I experienced when I migrated. So I connected to it very deeply. 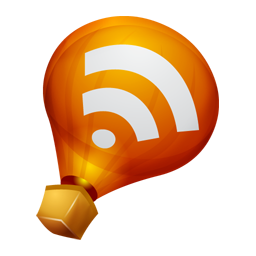 ps: Could you change the link to my blog title to Bookie Mee (the new one)? Sorry to be a pain! :) Thanks. Very nice. Both books look gorgeous and well worth checking out! I've never heard of Shaun Tan, but the art you showcase from his books are breathtaking. I'm adding this to my wishlist, stat. Wowzers, are those pictures beautiful. I think I already have The Arrival on my to be read list on Goodreads but I am off to check and be sure right now! Kristy: Have you read Persepolis and/or Fun Home? From what I've learned about your taste in interests since I started reading your blog, I'd highly recommend those two graphic novels to you. Andreea: His art really is gorgeous. There's nobody quite like him. Amanda: That's a very good point. Andi: I know it might be soon to say this after only two books, but I'm half convinced he can do no wrong. Jill: I can't wait to hear what you think! Zee, very good point about the language! I can't believe I didn't think of that. Jodie: I know! It's a perfect image really. Eva: I bet you're actually more well-read than me when it comes to graphic novels, just like when it comes to every kind of book :) I've known about Tan for a while, but because I had to buy his books to be able to read them it took me a while to get to him. I really wish I had access to a library that carried comics. Michelle: He's well worth picking up! I can' wait to hear what you think of his books. Heidi: Yes! That was such a moving image. Trisha: They're worth owning for sure! Mee: You and Zee are so right about the language! And I'll change it, of course! Sorry that I forgot - and you're not being a pain at all. Jason: You definitely have a point. It's one thing to be depressed for reasons you can't identify (or even for no reasons other than brain chemistry), and quite another to feel bad about specific things in the world or in your life. It bothers me when psychiatrists prescribe anti-depressants for situation b), because how can that help? It's not very different from telling people to drink their problems away. Sometimes you really have to get to the root of it - and yeah, until you do it's hard to see a Red Tree. Or even IF you do, as there are things in the world you can't really change. April: Aren't they? And they aren't even the best. Kathleen: Do add it if it's not there already. I'll definitely have to look for The Arrival. I love the artwork you've featured here, Ana. I haven't really read any graphic novels that don't include words--at least not many. As you know, I loved (as in really, really loved) The Arrival! 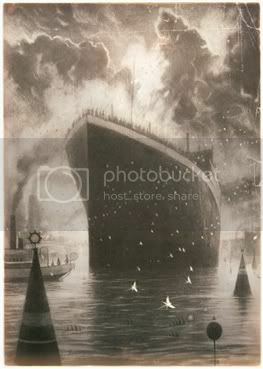 I think my favourite thing about it was having my then 8 year old son tell me the story he saw in the pictures, and then I told him the story I saw. There were similarities, but there were differences as well. It must be time for me to reborrow this book, or maybe to actually buy it so I can look at it whenever I want. I seriously slightly hate myself right now. I should have quickly read one of Shaun Tan's books when he was at the Foyles I was at, and then instantly become his biggest fan and met him and asked him questions. In lieu of that, though, I guess I will just get some of his books next time I am at the library. Well, you know how much I absolutely loved The Arrival. I have The Lost Thing and Tale of Outer Suburbia here, but I haven't yet bought The Red Tree -- maybe in my next round of buying. Tan's art sometimes leaves me speechless. The illustrations in these books are just gorgeous! I haven't read anything by this author but this review has made me want to go out and look for both books. I find it amazing that the author is able to tell such an emotionally complex story without the use of words in The Arrival, and I think that is the one I am going to search out first. I read The Arrival a while back and was very worried about how I would feel about it having no text. But a few pages in I was hooked. It made me remember being a child and how the illustrations in books could hold my attention for hours. We were probably reading this at about the same time. 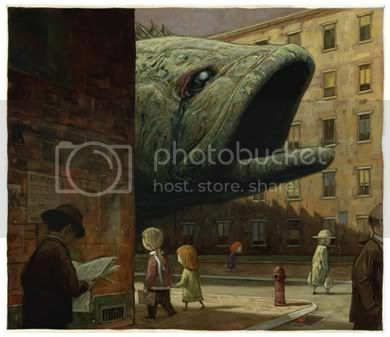 The first I saw of Shaun Tan's work was his illustrations for Pretty Monsters, which I really, really loved. Not an attitude I usually have about modern spot illustrations. The Arrival was an especially wonderful experience for me; I found that the friction between words and pictures that make reading regular graphic novels rather effortful for me disappeared, and I was able to just float on the images, instead of having to force myself to slow down. I think one of my favorite things is how he gets sent home from the dinner party with the pot that you're supposed to put on the windowledge so the creature nests in it. Wonderful metaphor. I found out about "The Arrival" quite recently, and I was hoping this would be the one time I'd actually tell you about an interesting Graphic Novel you weren't familiar with. Obviously, my plan was foiled... as I soon realized from reading this customarily apt review of yours. Well, turns out the surprise was on me, since I didn't know about the Red Tree and it seems rather interesting as well. Actually... now that I think of it, since you enjoyed the experience of going through a wordless graphic novel, and as you mentioned it was the first time you had read such a thing... you should pick up one of the books in the Gon series by Masashi Tanaka. That's a Japanese comic about a resilient but tiny dinosaur, making its way through contemporary wilderness and looking out for the weaker links in the food chains. It's a relatively old series from the 1990's, but a timeless classic in my opinion -- not a single word or even onomatopoeia in any of the 8 or so volumes comprising the series. Unlike "The Arrival" though, it's mostly a realistic series that sometimes feels just like watching the National Geographic channel, the major (only) fantasy element being the very protagonist.